There are many websites dedicated to providing the public with information about the biological sciences, but ActionBioScience.org may be one of the best around. 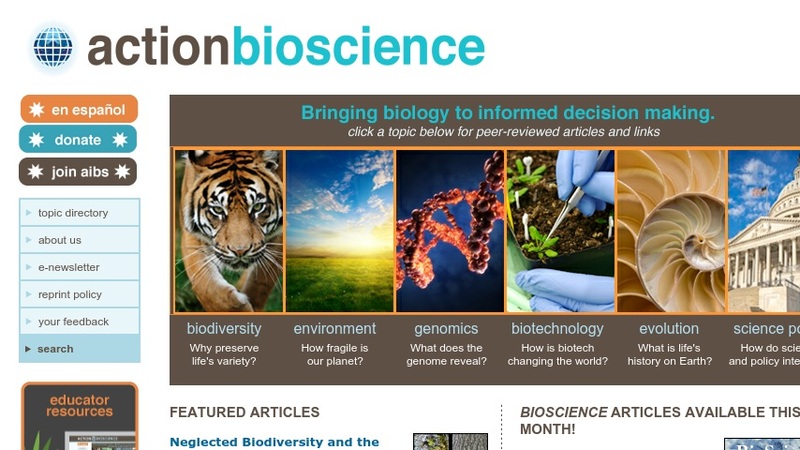 Started in 2000 by a group of concerned scientists and educators, the site provides articles by scientists, science educators and students on issues related to seven primary areas, including genomics, biotechnology, evolution, and biodiversity. All of the pieces on the site go through a peer-review process and are written with a keen eye towards providing information in a way that is largely jargon-free and highly accessible. From the homepage, visitors can look for articles in one of seven thematic areas, look for materials in Spanish, and peruse materials created just for educators. The site can also be browsed topically in the larger categories of Biodiversity, Environment, Genomics, Biotechnology, Evolution, and New Frontiers or from the "topic directory" which alphabetically lists all the bioscience subjects covered on the site.